Group interview questions are often used as an initial screening tool to select candidates for a second, one-on-one job interview. The types of interview questions are usually general and not specific to the technical aspects of the job opportunity. The main purpose of group interviews is to determine qualities like communication skills and interpersonal ability, persuasiveness and the ability to influence others, leadership and delegation. Other competencies assessed during a group interview include problem-solving and planning skills, stress-tolerance and the ability to work and contribute effectively as a team member. Expect some debriefing-type questions. 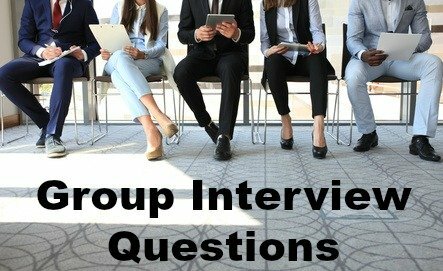 These group interview questions will most likely be asked in a group situation after the team exercises have been completed. Refer to aspects such as the good use of available resources, the management of obstacles, successful team communication, use of initiative and support and encouragement of each other. Focus on the approach the team took and acknowledge the contributions of individual members. Refer to your strengths such as planning and organizing, analyzing and problem-solving. Support your answer with specific examples of how you used these strengths to contribute to the team. What special role did you play and how was your contribution received by the team? Refer to the reasons why things did not go according to plan, give specific examples. Demonstrate that you have been able to realistically analyze the situation and explain what you would have done, with hindsight, to improve the situation and deal with the problems the team experienced. Show an ability to offer solutions, not just to point out the problems. Describe the specific steps you took to remain calm and controlled. Focus on skills such as planning, flexibility, communication and discipline. How would the other team members describe you? Refer to the positive reactions your experienced from other team members. Support your perception of how you came across with examples of observations or remarks made by the team. These are designed to get to know you as an individual may be asked on a one-to-one basis during the group interview process. Avoid just repeating what is on your resume. Focus on highlighting your skills in a positive and job-relevant way. Try to set yourself apart from the other candidates as the most suitable person for the job. You need to think about the job requirements and emphasize your fit with these needs. You can mention observations others have made about your strengths and abilities to reinforce your answer. View interview questions and answers to help you answer group interview questions about yourself. Think about the interpersonal style you use with co-workers or your peers. What adjectives would they use to describe you? Dependable, resilient, helpful, energetic. Use the guide to what are your strengths? to help you with this. Support your answer with examples. "They describe me as dependable, probably because I always meet my deadlines." or "They consider me highly adaptable, I am able to work effectively with very diverse people. My last department consisted of ......"
These group interview questions explore your personal motivation for the position. What about this position appeals to you most? Give specific examples of why this position and company excite you. Refer to the positives you have learned about the organization and the job from this group interview process. Think about how you can prove your passion and interest for the position. Why would you prefer to work for this company rather than their competitors? Use your background research to prepare for group interview questions like this. Use the excellent resources listed at preparing for a job interview to help you prepare. What are your goals and how does this company and job fit with these goals? Tailor your goals to the realities of this position and company. Don't offer specific job titles or time frames. Focus on types of experiences you hope to gain and the abilities you want to develop. Consider realistically the opportunities available in this organization. Refer to what you will learn in this position and how this fits in with your personal development plan. Use the sample answers to help you prepare for interview questions about you future goals at Where do you see yourself in 5 years? Prepare for a general interview question about your suitability for the position. "I have worked as part of a team on a number of projects and received positive feedback about my role and contribution. Particular mention was made of my ability to initiate new ways of looking at the challenges and problems and then encouraging contributions from other team members." Think about your strengths and the benefits they bring to the company and position. Give proof of what you can offer to excel in this job. "My problem-solving ability has been put to the test many times. For example, ...." Discuss your specific qualifications for the job. Always refer back to your enthusiasm for the position. Excellent example interview answers to Why should we hire you? How do you stand out in a group interview? Set yourself apart from the competition by having planned and practiced for your group interview. 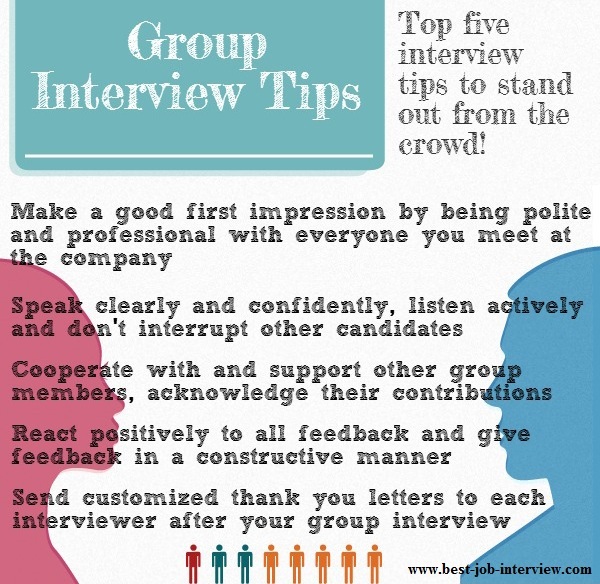 These group interview tips will help you. Go to the full list of excellent group interview tips. Be ready for fun group interview questions used to test your ability to think on your feet. Your communication skills are key to success in group interviews. Make sure your interview body language is sending the right message. Professional follow up on your group interview interview will set you apart from the other candidates. Find out about panel interviews and how to prepare for them.